I needed to write a couple notes today in a notebook and found these little beaded beauties from long ago. They were cut from larger notebooks but you can easily use a full size notebook. 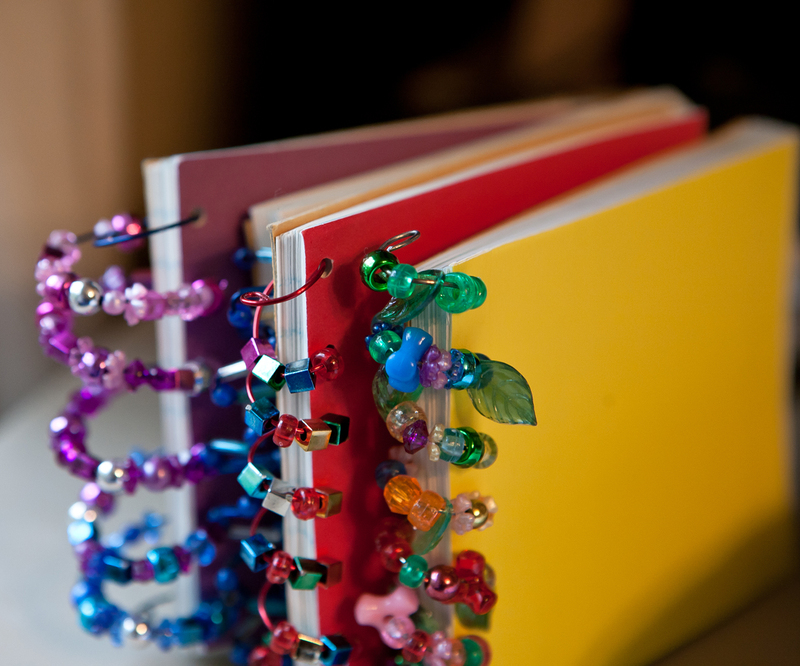 If you want to make one, just unwind the spring coil from a notebook and add beads as you put the spring back on the pages. Don’t fill each coil all the way with beads or the covers won’t be able to open fully. Add a few rounds of beads and test how the notebook opens before completing the beading. I don’t know the age of your granddaughters but if you help, I’m sure they would have fun picking out the beads and putting the beads on the wire. You can also use shank buttons. Make sure you test the first couple coils of wire after adding beads or buttons to see if the notebook can still open far enough. Fabulous! Though you re-wired those yourself, didn’t you? wow I remember you showing us how to make those one summer. you brought us two big purple plastic boxes that had all sorts of beads and seashells in it and we did all sorts of crafty things. That’s definitely a summer I have never ever forgotten. We all sat in the our dining room and had everything all spread out everywhere. That wasn’t log after we moved up here if I remember correctly. One of the first summers you visited us. We were really young.